The Surface 3 with type cover and stylus pen. Verdict: Microsoft has improved on its hybrid in all the right ways, but provided you can make some compromises, it’s a device that’s more than the sum of its parts. NOT ONE TO give up on an idea, Microsoft has been pushing the Surface range since 2012 and after some failed attempts, it looks like it’s finally starting to pay off. That started with the Surface Pro 3. Released last year, it was a pricey tablet/laptop hybrid but it was the closest Microsoft got to bridging the gap between the two devices, while offering the hardware to back it up. Following close by is the new Surface 3, aimed mainly at students, and is Microsoft’s way of making the range as cheap as possible without too many sacrifices. Yet while it’s certainly getting better at it, has it done enough for the average person to start considering it? When it comes to design, Microsoft has the Surface range down to a fine art and at this point, it’s hard to see where it could be radically improved. Light and comfortable to hold, it sports a 10.8-inch screen which is a large size for a tablet but a decent size for a laptop, striking a good balance between the two. It’s probably comparable to a medium sized textbook when holding it, especially if you have the type cover which we’ll get to later. Weighing 622 grams and a magnesium alloy body, its size is compact enough to fit in a small bag and you wouldn’t really notice it if you were carrying it in your bag. On the side, the device fits in one USB port, one micro USB port (which also serves as the charger port), a display port and a headphone jack. There’s a micro SD port hidden behind the kickstand should you need extra storage, always a welcome option. Unlike the Pro 3, the kickstand can only be adjusted to three fixed positions instead of any angle you wish. While it’s a little disappointing, you’re not going to be frustrated by the lack of choice if you haven’t used one before. It’s sturdy and it manages to rest on your lap without making you feel uncomfortable, allowing you to focus on typing and using it . Speaking of typing, the type cover accessory follows the same improvements that the Surface Pro 3 brought. Light, strong and really nice to type on, the only drawback is the mouse trackpad may be a little too small for some people, making gestures like scrolling a little difficult to carry out. Yet the biggest problem with the type cover isn’t what it can and can’t do, but the fact it’s an accessory. If you purchase the Surface 3 (or any of its versions for that matter), you have to purchase the type cover and the stylus separately. Having to pay extra for it puts a damper on things and the Surface 3 really doesn’t feel the same when you don’t have the type cover. While the physical design is great, that wouldn’t matter much if the device itself struggles to run software. In short, it’s good although you would need to keep your expectations in check when using it. The 10.8 HD display and 1,920 x 1,280 resolution helps when you want to watch shows and films on it, something highlighted by the 3:2 aspect ratio. The display isn’t going to match the amount high-end screens pack in, but it’s crisp enough for a device like this. The four speakers are (subtlety) placed at the front of the tablet, close to each corner, and you wouldn’t even notice their positioning until they’re used. It does feel most at home when you’re watching Netflix or videos on it. That’s not to say it can’t handle web browsing or any other tasks, but you have to go easy on it. This really isn’t designed for heavy usage so any programmes or apps that go heavy won’t bode well for it. It’s able to handle multiple tabs on Chrome, but if you start using intensive services like Tweetdeck, you’re going to notice a bit of lag. The same applies to more complex 3D games. One thing to note when using it. No matter how hard you push it, it always manages to remain quiet throughout, an achievement in itself. Running on Windows 8.1, the same issues it had before are present here. In short, the tablet and laptop elements of 8.1 still feel as disjointed, and selecting certain apps like Internet Explorer on tablet mode will bring you to the desktop version instead of an app version. Windows 10 appears to be fixing this and those who get the Surface 3 can upgrade for free when it arrives this summer (no specific date has been announced yet) so there’s that to look forward to as well. More importantly, the Surface is able to run the standard Windows desktop programmes that you use which is a major plus. Previous versions ran on Windows RT – a stripped down version of Windows 8 – so getting rid of that alone is a major plus. Also worth mentioning is the stylus or Surface Pen, which has come in leaps and bounds, and is really waiting for the apps that will help do it justice. This isn’t as big a problem as you would think, it is an optional purchase, and considering its range, it’s an understandable decision. Apps like Fresh Paint and Microsoft Office are great for giving you an idea of its potential (clicking the top button to quickly open up Office for note taking is one smart example), but that’s it really. When the Surface Pro 3 was released last year, it was Microsoft’s best effort at bridging the gap between tablet and laptop, although the price would have put many people off. 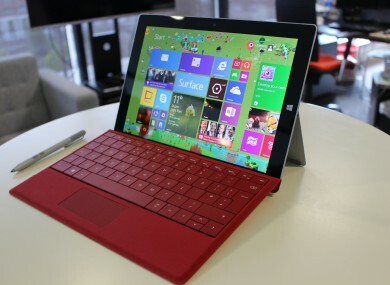 The Surface 3 is a cheaper version of that and carries the same philosophy, making it a more attractive proposition. If you compare it to other laptops or tablets, devices that serve one single purpose, the Surface 3 doesn’t quite match the best out there, but what it does instead is manage to cover all bases competently without any major flaws. It’s not amazing at any one thing, but it achieves everything it sets out to do without fuss. Provided you don’t mind a few compromises here and there, and aren’t fixated on one sole purpose, you will find a versatile device that will more than serve your needs. - Able to run Windows desktop. - Switches between different functions without problems. - Manages to be more than the sum of its parts. - Type cover and Surface Pen are still stand alone purchases. - Doesn’t excel at any one area. - It’s really designed for basic computing. - Windows 8.1 is still as disjointed as ever. The Surface 3 costs €609.99 for the 64GB/2GB RAM version and €729.99 for the 128GB/4GB version. It’s available at Microsoft Store, PC World, Currys and Harvey Norman. Email “Microsoft has created the first cheap Surface you will actually want”. Feedback on “Microsoft has created the first cheap Surface you will actually want”.